It’s common knowledge that dogs’ hearing is exactly 500 gazillion times better than humans, and you can triple that for Aussies. I can hear a sneeze up to 2 miles away and can instantly identify the species, gender, age, ethnicity and snout size of the sneezer. This impressive talent may be of great value in the wild, but it results in only limited domestic worth. In fact, I’ve found that my enviable ears carry a few specific detriments. One of these is listening to Mom and Dad. I quickly learned to tune out their one-word instructions (sit..no..stay..no..come.. no, etc. ), but other noises they emit truly strain my coping capabilities. This morning, Dad read that it was Barbra Streisand’s 70th birthday. He apparently is a big fan, because for two excruciating hours he launched into his version of every one of her greatest hits. Some people, like Barbra Streisand, were born to sing and they can make some pretty impressive sounds even for my sensitive ears. Others, like my dad, should be subject to felony indictment for any attempt at musical vocalizing. He sounded like a cross between a severely wounded hyena and our car’s screeching tires at virtually every stop sign. There was no place to hide, so I stuffed my head under a sofa cushion and rode it out until someone from the homewoners’ association came to the door and informed Dad that he was in violation of ordinances barring lewd and disgusting noises. I thanked the Aussie gods that Dad’s vocal cords were finally brought to justice. But the damage was done. I’m making an appointment with my vet-analyst, as I’m already exhibitng symptoms of PTSD (post traumatic singing disorder). While I’m out, I’ll pick up some noise-canceling headphones. Now, Dad’s talking about sound-proofing a room just so he can ‘sing’ without risking a prison sentence. Trouble is, he’ll probably take me in there while he generates his other-worldly noises. I have not lived an angelic life, but I don’t deserve that kind of hell on earth. Perhaps the military can utlilize Dad and his new room for interrogation purposes. I’ll contact them. Meanwhile, Happy Birthday, Barbra. And..thanks a lot!! 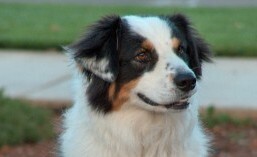 This entry was tagged aussie, australian shepherd, barbra streisand, birthday gifts, blog, dog, humor, music, singing. Bookmark the permalink. Dog gone it! I wonder what Babs would say about all of this!